This High Heat Load XY Slit is designed for the beamline frontend. The main body of the slit is made from GLIDCOP® for high thermal conductivity and strength at high temperatures. The internal profile of the main body is tapered on two sides. Complex water cooling channels are bored into the block to ensure effective heat removal from the tapered absorbing surfaces. This water cooled body is mounted on a stepper motor driven XY stage which allows very precise positioning in the beam. 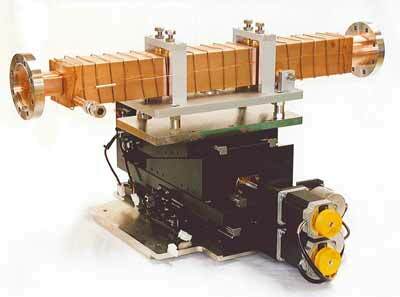 By placing two such slit bodies one after the other the SR beam can be shaped as required for the subsequent optics.